For a lot of guys that request for hair growth products, the culprit is balding. With women, balding is an extreme case of aloepicia. Hair loss as a result of braids, weaves, cornrows and wigs is quite rampant in Ghana. We have a long way to go as regards good hair practices but until our hair dressers are fuller on board, you owe it to yourself to give your hair with the most utmost care. When after interactions you realized it's not genetics, I ask the customer to explain their hair routine as well as lifestyle. Usually, I advise they give the oils a try whilst improving on their diets as well as adding supplements. If these fail, then, they could seek medical interventions. Most often, the problem gets resolved. So, why balding? The bathing soap you use is too drying which causes breakage. The right braids have to sleep. Request your stylist not to even braid the edges. Tight braid lead to hair loss. Sleep scarfs, wig caps can also rub on the edges thereby causing hair loss. 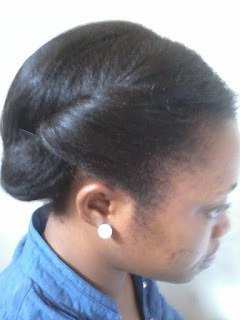 Lace wigs and lace frontals can rub on the edges too. As you eliminate these practices, you can look into hair vitamins and hair growth oil mixtures to hwko restore your hair loss. Years of braids have caused my hair loss at the hair line. As a result of this, I'm staying away from braids until they are fully restored.